Trails in New Zealand are called tracks. Several tracks surround the Nelson area and most of them climb a hill. What amazes us the most is the vegetation along these tracks. One moment we seem to be walking through a rain forest where cicadas buzz loudly, and then around the corner we will be wandering in a grove of Monterey Pine. During our hikes we go through several stiles and gates, through sheep pastures, and then find ourselves among a variety of deciduous trees. Silver ferns, a New Zealand symbol, grow as tall as trees and provide needed shade along the way with their broad fronds. It always surprises us when we come across historic redwood trees towering as tall as any you might see in the redwood forests of California. Original settlers to Nelson found this area a difficult place to settle because it had very little arable land. Many of the original settlers that came from England with the New Zealand Company in the 1840s ended up leaving the Tasman Bay area because they were unable to establish a farm. Eventually, as Nelson grew, so did the public spaces. Beautiful parks dot the town like the Queen’s Garden, the Botanical Hill, and the Miyazu Japanese Garden. Each of these is a short walk from our cottage and also provides serenity as well as spectacular floral displays. We picked up a little book from the city council titled, Walk Nelson. It describes 56 walking trails around the area. Our favorite after dinner stroll is the walk along the Maitai River path. Longer walks take us around the marina and Tahunanui Beach. We have learned to value outdoor spaces as the do Nelsonians. Just up the hill from us is the beginning of the Grampian Reserve. Nelson nestles at sea level and when tramping up to the summit of the Grampian Track, we climb a steep 1,240 feet and rest while taking in the spectacular views from the lookout. Tomorrow we will zigzag to the top for the third time, and once there, we will have several tracks to choose from for our decline. We must always consult the map wisely or we could end up in the next town of Stoke looking for a bus stop. 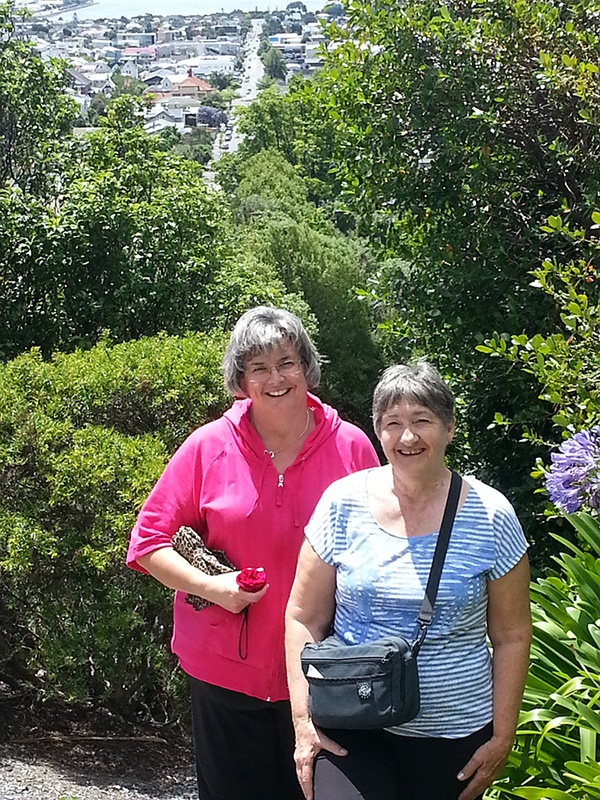 An iconc walk for locals and visitors, the Centre of New Zealand, is on Botanical Hill. Its name comes from being a geological reference point when first sectioning off land. The track starts at a landmark park which is the site of the first ever rugby game played in New Zealand. 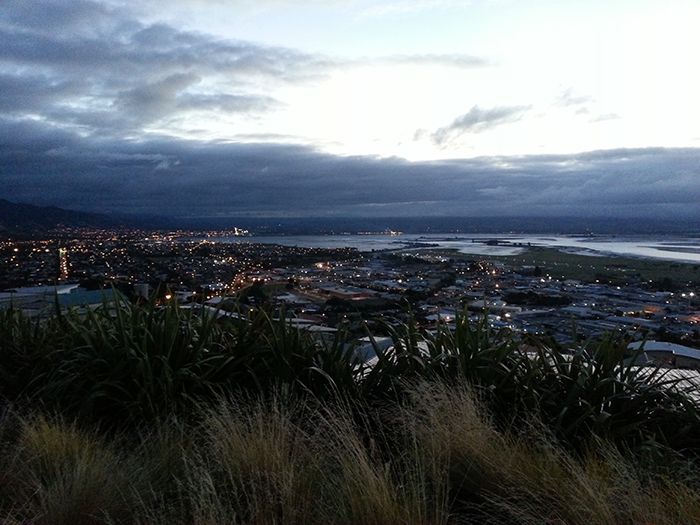 Although tramping up this hill is not as long or steep as the Grampain, it does provide us with a stunning view of Nelson and the Tasman Bay. Once again we can choose from a variety of descents taking us either across the ridge through gum trees and sheep pastures, or through variegated vegetation and down to the floor of the Maitai Valley. 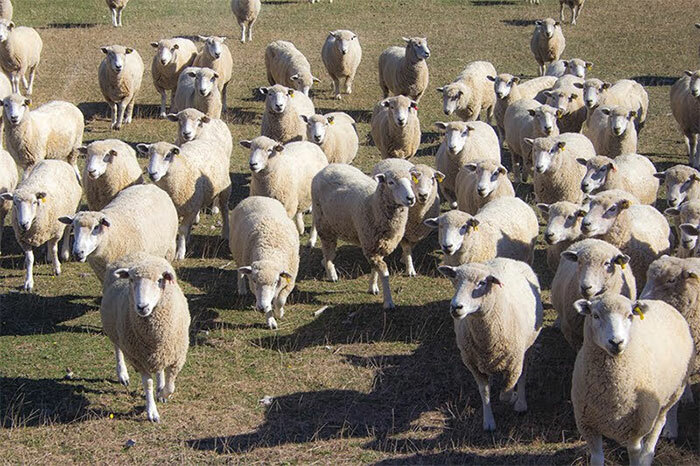 So what’s up with the sheep? Livestock graze in the reserves as an environmentally friendly way of maintaining them. Sheep love to graze on a weed that can smother native plants. Managed grazing reduces fire risk as well as hugely reduces the costs to taxpayers. A few sheep have balked at us tramping through their pasture, but most of the livestock just keep on munching as we pass. We just have to watch where we step. We walk just about every day with a purpose. 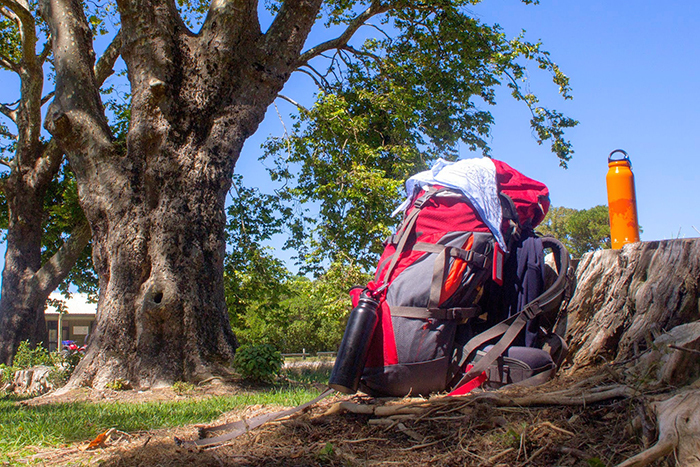 In two weeks we set off on a five-day backpacking trip on the Coastal Track of the Abel Tasman National Forest. It’s a 60 km track along the coast of one of the most beautiful places in the world. We look forward to sharing our experience with you on our return. 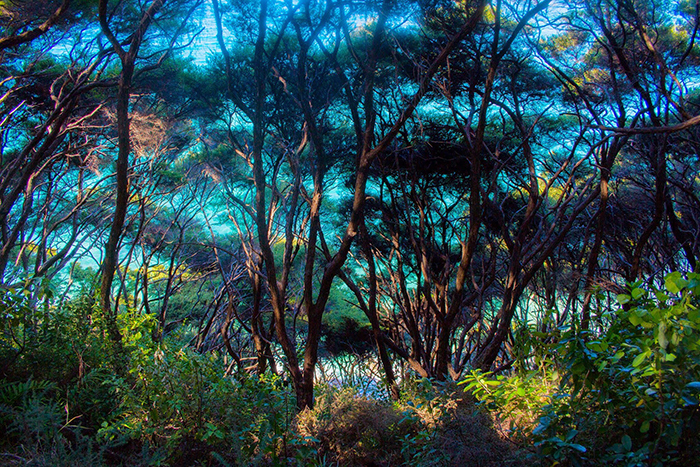 View Ramble Dog Photos of New Zealand. We spent the afternoon on Rabbit Island today. A twenty-minute drive from Nelson is the a lovely park along the beach. Campsites are simple with grass pull-ins, a picnic table, and a large barbeque. We chose a site along the beach. 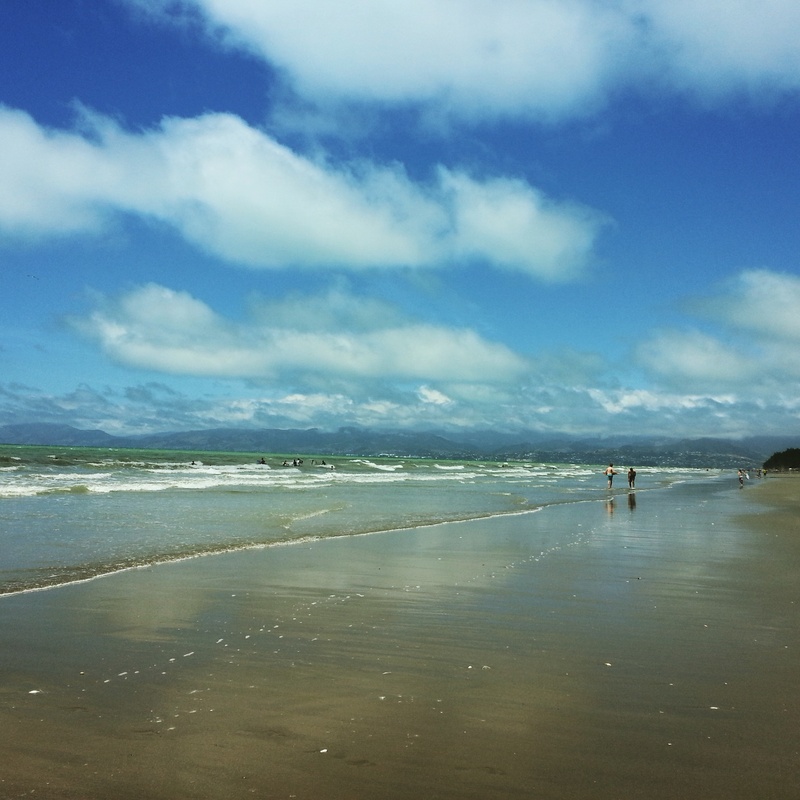 This beach is along the Tasman Bay, named after New Zealand’s first European discoverer in 1642. Abel Tasman was a Dutch explorer on a trading ship from Indonesia, but that is another story. The tide was high as we played in the water with our new friends, Tressa, her daughter Emily, and parents, Nelly and Ricky Nelligna (Maryann and Roger made friends with this family on a previous trip to NZ). Compared to the Pacific Ocean water in northern California, the water here is warm. It was a midweek summer day, and the beach was not that crowded. When it was time to light the barbeque, we first gathered firewood from the wooded area around our site (an act that is usually restricted at parks in the states). I learned later from Peter that the park often allows people to come and collect firewood for their home fireplaces. Our hosts loaded up the large BBQ with burgers, sausages, and onions. The spread was an amazing collection of foods from both homes. We had fresh fruit like apricots, pineapple, grapes, and berries pick from the side of the road, hard-boiled eggs from the Tressa’s chickens, olives, and fixings for the delicious meats. How wonderfully delicious and oh, so very filling. After that meal from heaven, we strolled barefoot along the beach. A strong breeze, the warm summer sun, and our feet in the ocean water made the perfect combination for comfort. What a blissful time we had at the beach. An event we plan to repeat again while we are here. 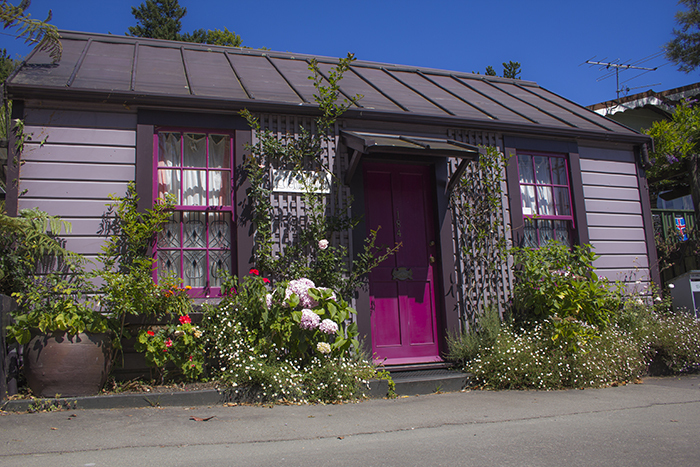 I had seen a picture of the purple cottage with its fuchsia doors, blackberry-colored trim, and mauve wisteria growing around the front door. We even “drove” by it on Google Earth, but nothing prepared me for the instant attraction I had when I walked in the front door. 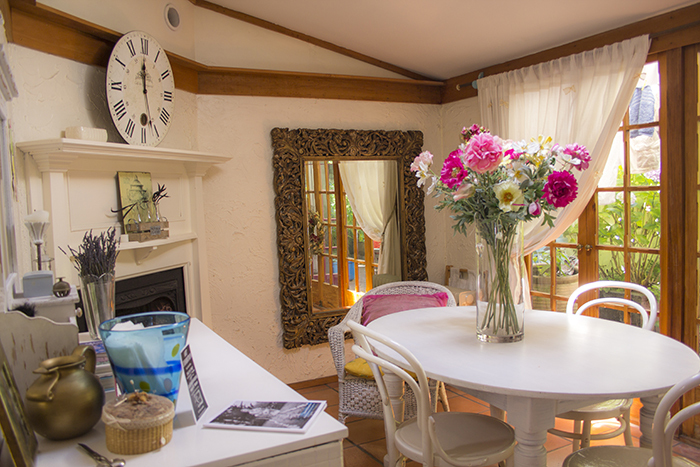 It’s a darling little house, perfectly decorated with eclectic French country elements. The home, built in the 1980s, is a replica of an 1867 cottage and was first named La Petite Maison in 1888. The simple design represents an almost forgotten glimpse of the past. I love the postage-size kitchen. 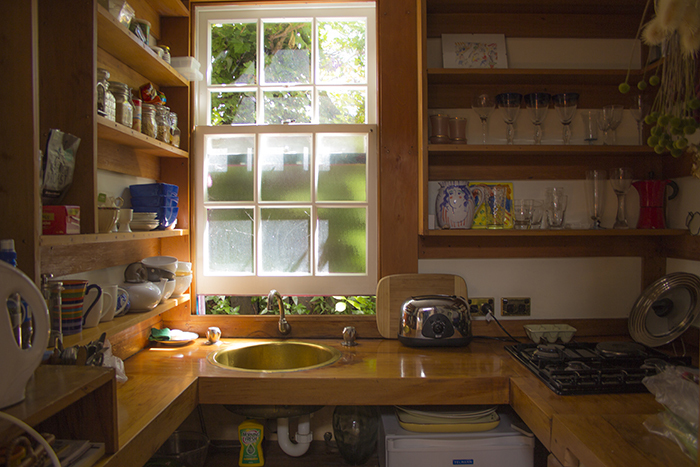 The copper sink sits under a window and is the center of a horseshoe butcher-block countertop. There are no cabinets or drawers but utensils are stored in pitchers and vases, an eclectic collection of dishes and glassware sit stacked on shelves, and pots hang from hooks. Dried flowers hang from an herb rack in the corner over a microwave. A small front-loading washing machine as well as an even smaller refrigerator rest under the counter. Baskets hold dish towels and cleaning supplies. The gas stove is fueled by a propane tank under the counter. The kind you would usually find with a gas barbeque. There are plenty of shelves to store food, although we can’t all reach the ones at the top. All three of us may be able to fit in this kitchen at the same time, but actually preparing a meal is a one-woman show, or a one-man show when it’s John’s turn to cook. Lined up along the back wall of the cottage are three French doors that open outdoors to a handkerchief-sized courtyard. It’s more of a private patio oasis. An L-shaped planter box fills up the corner containing long-stem hydrangeas, camellia, magnolia, ivy, and something with a purple flower that we don’t recognize. Various copper-colored, clay containers are scattered around on the hexagonal pavers. 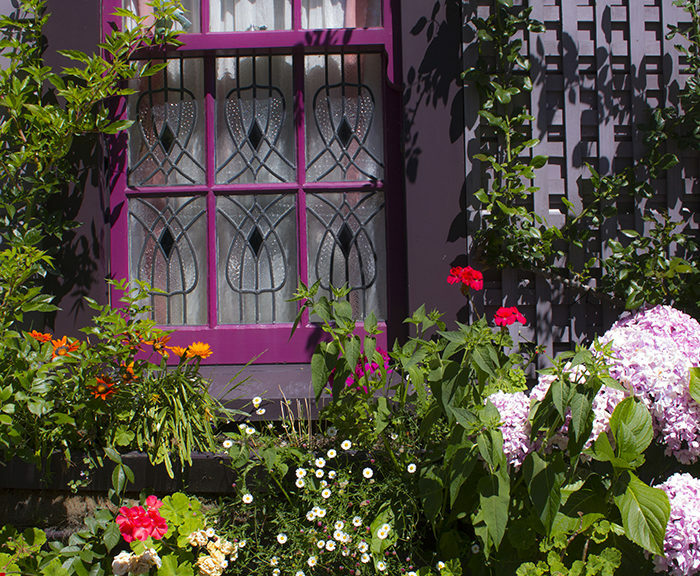 They grow herbs, small flowers, roses and fuchsia. We often sit around the small table with our morning coffee. 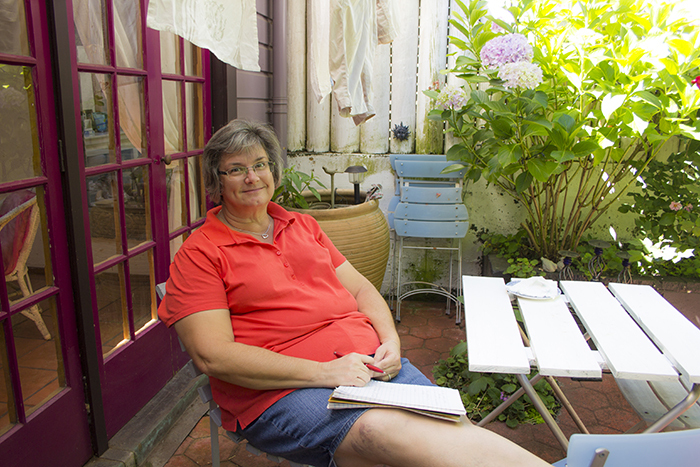 Maryann enjoys sitting out there soaking up the warm afternoon sun while knitting. We all agree, it’s our favorite place to be surrounded by plants that seclude us from the world around us. Only moments after walking into the lilac cottage did I comment that I felt as if I was walking through the pages of a country living magazine. 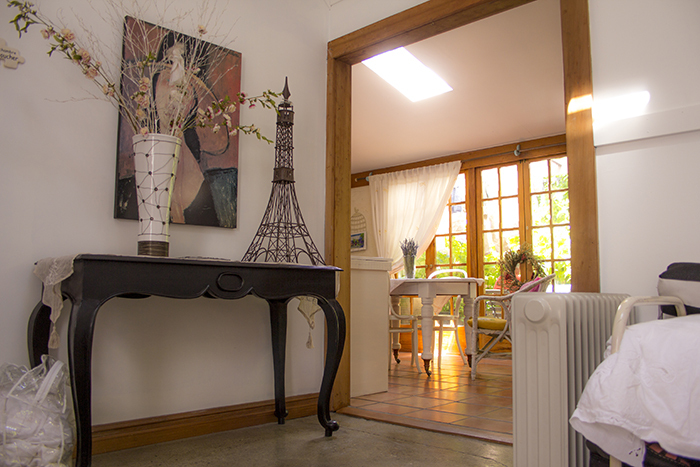 Annette Hollis, the owner and decorator was quoted in the December 2011 New Zealand Home and Garden article saying she feels most comfortable in a shabby-chic French style. Black and white furniture surround an also black and white cowhide area rug in the living room, and dusty rose silk curtains accent the leaded-glass windows that were crafted by a previous artist-owner of the home. The sofa is an antique daybed and the only bedroom is separated with an ivory gauze curtain. Oversized vases with silk and dried flower arrangements are place throughout the cottage so on our first walk around town, I picked daisies to place in a small vase on the dining table. Every inch of this cottage is darling. We have spent a full week in La Petite Maison already, and it truly feels as if we live the simple life. 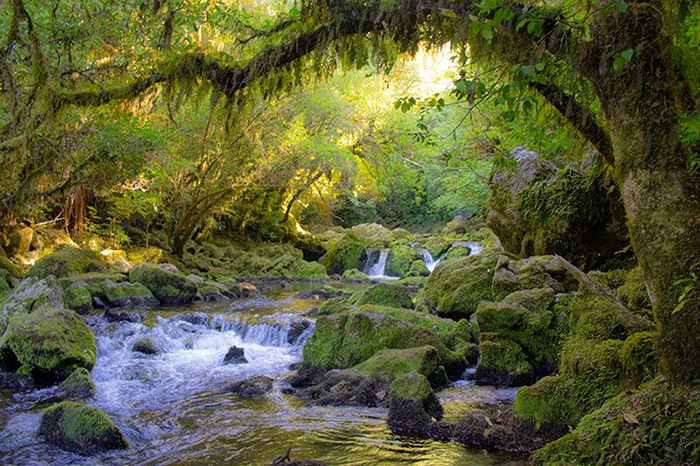 It’s a slice of heaven and oh, so very New Zealand.